Total voice over narration (no host on camera) , English Scripts and M&E Tracks on all episodes. Green Minute is a powerful new series that is in step with one of the most universal topics of discussion in all of our lives, the environment , and our earth and how each of us relates to it on a local level. Green Minute addresses individual solutions, international events, and cutting edge inventions, gizmos, and gadgets that are now in the news and in your neighborhood. In a 1 minute episode, your viewers will gain insight into how they can participate and the steps others are taking to work together to discuss the problems and find solutions to these worldwide issues. 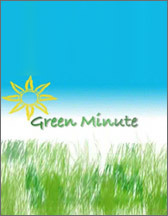 Green Minute is available for the first time on a first run basis. The series appeals to every demographic and target audience. It is flexible to program, can bring prestige, viewer loyalty, and advertising support exclusively to your network. Green Me - What can I do as an individual to help? Green World - Who is involved internationally and how are they making a difference? Green Gizmos - What are the new gadgets, inventions, and prototypes being developed? GREEN HOTEL: Hotel which offers eco-friendly amenities. YOUR YARD AND GARDEN: Plant flowers, trees, bushes, ground cover and vegetables instead of grass. A lawn is an unnatural ecosystem. Lawns use more water and mowing contributes to global warming. ECO FASHION: An exhibition in London points the way to more environmentally friendly fashion. SAVE MONEY OF FOSSIL FUELS: Light bulbs, Energy Star products, wind, and hydroelectric power. JAPAN MAGNETIC MOTORBIKE: We take a look at a new electric motorbike that carries a hybrid magnetic motor. GERMANY BIO-VILLAGE: Juehnde is Germany's first bio-village. It's been weaned off oil and fossil based energy technology and on to a new energy source. WIND POWER - SPAIN: Spain is looking to increase its expansion of renewable energy sources. ELECTRIC CARS: We look at an all-electric car in the United States with the performance of a sports car. CHINA - RAIN: Chinese weather experts have resorted to using chemicals to create rain to help relieve drought and rinse dust from China. FLOWERS: Growers in the Netherlands are developing drought resistant flowers. DROUGHT AND FIRE: New research shows we are at risk of increased fires, floods, and droughts. GREEN ARCHITECTURE: Some of the world's leading architects have been invited to design homes for the heart of a nature reserve. REGENERATING TOWNS: How urban landscapes can be radically improved for those living and working in it. SOLAR POWERED LAUNDRY: We look at a laundromat with solar hot water. RAIN FORESTS: Masoala is one of the last Madagascar forests in the world. It is currently under a protection order to sustain its existence. TREE COMPANY: An English company has developed a new way of growing trees for commercial and landscape use. GREEN BAKERY: A New York bakery has not only taken on organic cooking but it's interior is made from recycled, biodegradable, and natural materials. OLD ELECTRIC CAR: A 100 year old car that works as well today as it did the day it was made.